Drive Size: <3/8", 3/8" to 1/2'', <3/8, 1 /2" to 1"
We have uniquely positioned ourselves as the topmost wholesaler, trader, retailer and supplier of Pneumatic Air Wrench. These air wrenches are tested in terms of quality in order to ensuring the flawlessness. Drive Size: <3/8", 1 /2" to 1", 3/8" to 1/2'', >1"
- Robust, comfortable and versatile composite impact range covering most of the industrial maintenance needs. 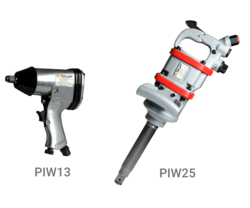 Our clients can avail from us a wide range of Pneumatic Impact Wrench. It is used as a tool for screwing and unscrewing nuts & bolts. Our range is in high demand in the market. Different sizes and designs is easily available in the market. Our range can be availed at market leading prices. Drive Size: 1 /2" to 1"
We are leading supplier of Impact Wrench. This impact wrench is manufactured as per the industry set norms. Easy to operate, this impact wrench is used for repair and maintenance applications. 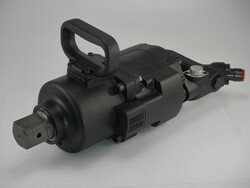 We provide this impact wrench in safe packaging material at reasonable rates. This Heavy Duty Impact Wrench with 6 in. Anvil delivers superior power for the toughest jobs on truck, bus, and heavy equipment applications.